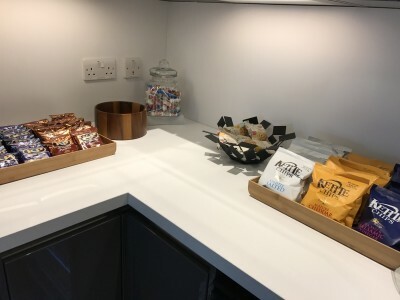 This is our review of the new Business Lounge at London City Airport. 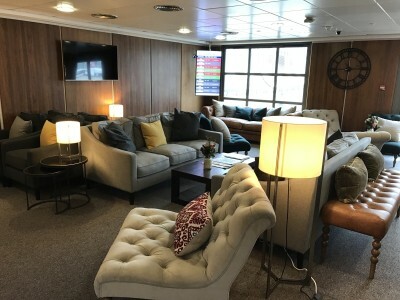 Back in November last year I tried the First Class Lounge at London City Airport. Despite the fact that this lounge is based in the Jet Centre and not the main airport, I really liked it. I was able to go through the lounge’s own private security facilities and get driven to my plane – which was cool. The price of £95 per person which has limited the market for this product. There were always plans for a separate Business Lounge with a smaller price tag (£35) and now it’s finally in use. 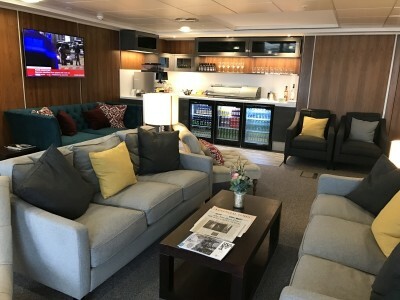 I went down to City Airport to have a look at the new Business Lounge, albeit without flying anywhere! As the lounge is landside this wasn’t a problem. As the two lounges are inside the Jet Centre, a driver picks up pre-booked guests at the main terminal at London City Airport. If you’re flying with luggage you need to check it in before being driven to the lounge – there are no check-in facilities in the Jet Centre. The drive takes about 5 minutes. As you can see in the picture below the Business Lounge is to the left along the building. The entrance for the First Class Lounge is through the blue doors. The opening hours are 5.30am to 10pm. 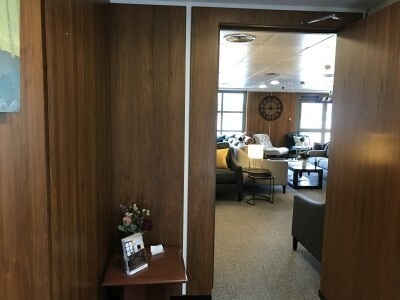 The Business Lounge is through the door behind the check in desk. The Business Lounge is a bright square room with various seating options. It has a cosy living room atmosphere. The armchairs in the corner by the exit door would be good when travelling alone or as a couple and if you prefer not to sit surrounded by too many people. The sofa area in the middle of the room could work for a family or a group of people. Food and drinks is tucked away in one of the corners. There were small bottles of red and white wine, various soft drinks, beer as well as Famous Grouse Whisky and Ketel One Vodka. Champagne is available to purchase at the lounge. When I visited the First Class Lounge last year the shower facilities hadn’t been completed, but they are now. 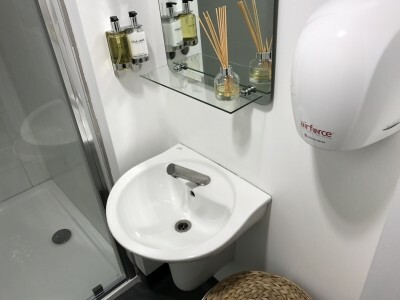 Accessible from both the First Class and the Business Class Lounge are two shower rooms with toiletries, towels and hair dryers. 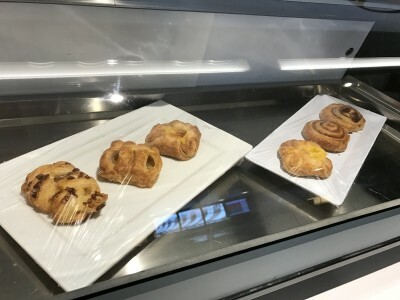 To give you a better impression of what you can expect, here is a short YouTube video of the Business Lounge. You can subscribe to our YouTube channel via this page – this is the same link to visit if the video does not automatically appear below. 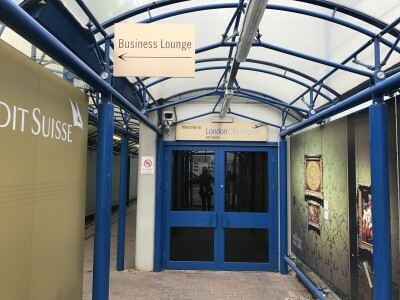 If you want to see our video of the First Class Lounge at London City Airport, click here. I like how personal both lounges in the Jet Centre are. It’s almost like hanging out in someones living room and you don’t feel as if you are in an airport (but then, of course, you aren’t ….. you’re 5 minutes away). I do understand that a landside lounge doesn’t sound ideal in principle. It is definitely not a lounge to grab a quick bite and drink before a flight, but if you have an hour or more to kill this is a great place to relax. 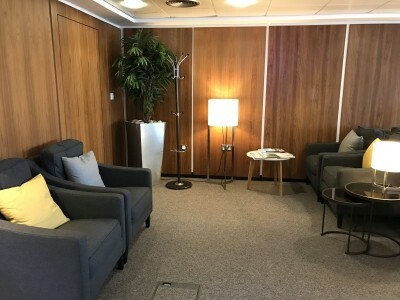 The staff are in constant contact with the airport and know when you have to leave the lounge to get to your gate (roughly 30 minutes before boarding) and if your flight is delayed you can stay in the lounge for longer. At £35 per visit, it is more expensive and less convenient than your standard airside third party lounge. It is also quieter and more private, however. 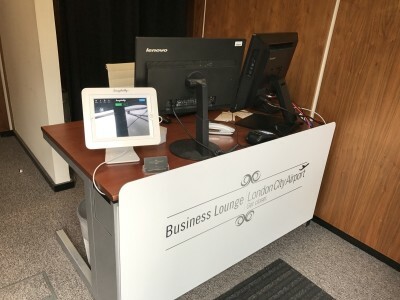 For the business market flying out of London City Airport, I suspect it is a small price to pay if it allows you to catch up with some work or make some calls. I’d also suggest that the Business Lounge plus an economy BA flight ticket is better value (and a better treat) than a Club Europe BA ticket without lounge access. 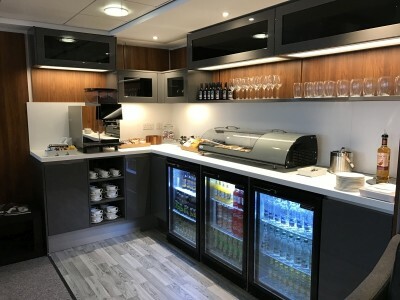 You can book access to the Business Lounge via the airport website. Pre-booking is not essential – you can book when you’re already at the airport and the lounge will contact you immediately to arrange pick up from the main terminal. Turning up more than 20mins before your flight at LCY is just a waste of time. Sounds like a lot of faff for an airport where you can turn up quite close to departure anyway. I guess it would/could be useful if you got to the airport and your flight was significantly delayed. Obviously if they took PP I would totally use it but I doubt that will happen, as so will everyone else. The biggest thing that would be put me off this is having to be driven to the lounge. I definitely wouldn’t recommend turning-up at LCY anything like as close to 20 mins prior to departure. That was fine in the early days, but now it really is a victim of its own success – the queue for security can be enormous at certain times of the day (early morning, primarily). Although the system has been managed a little better of late, it can still take up to 20 mins itself on a bad (busy) day. Might be handy for an inbound BA2 and onward connection, but that must be a very limited market. I did like City, used to use it almost weekly. PB was Canada Square to airborne in 40 mins, and Edinburgh City Centre in 2h 30… Sub-3 hours was easily achievable. I doubt you could do that any more, I certainly wouldn’t recommend trying it. That was on the wee Scotairways Dornier 328s as well which weren’t exactly fast fliers. As long as flying after 9am you can turn up 15 mins before departure and be fine so why anyone would use this is beyond me. Whilst I appreciate all the comments about the benefit of LCY being arriving not long before your flight, in reality, most people aim to get to the airport early to be certain they don’t miss their flight and avoid any unnecessary stress and/or catch up on work emails pre departure. I live in the Shoredtich area – so LCY is my nearest airport by a long way – but public transport can be unreliable and taxis/Ubers can take varying amount of time depending on the time of day/level of traffic/time of year etc. I’m not sure if it’s just me, but there have also been long security lines on all of my recent pre 9am departures. You’re kidding, right? Shoreditch is a stone’s throw from Bank and the DLR, which has its own LCY station! If you turn up at an airport within the published check-in time (15mins at LCY right?) then it becomes the airport’s and airline’s responsibility to get you on the flight. It’s an expensive mistake if they don’t (as long as you tell someone). This is why MAN T3 operates ‘triage’ for security-the queues are enormous but they’ll always direct you to the front if it’s tight. I wouldn’t have any qualms turning up at LCY 20-30 mins before departure at any time of day. 15 mins – now that’s into 2 SHORT PLANKS TERRITORY, surely you don’t think any airport would be so stupid as to advise 15 mins? Er, no, it doesn’t. The airport has no responsibility to the airline and the airline has no responsibility to the airport. That’s why BA had to move to a 45 minute cut-off time at Terminal 5. I agree with most comments in that I don’t really see the benefit – if you still need to leave the lounge with enough time to get through normal security then you lose the benefit of the comfort that you can just wait to be called – as was mentioned above security lines have got longer recently, I even once missed a flight by a matter of minutes as they closed the door to the gate just before I got there after being stuck at security for longer than expected! O/T – Anyone know what’s the best way to book cheap, decent airport parking at LTN? I agree with Harry. Airparks at Slip End is perfect. The lounge is quite good too which you can access with Lounge Pass or PP. MAybe DP too but I don’t know about that. Rob has written a review on the Lounge in the past. Are there any (reward) credit cards / charge cards which still count purchases of foreign currency as a standard purchase ? Either in general OR from very specific fx companies ? OR any other similar loophole ! +1 for Curve linked to a decent Visa or MasterCard. While my first impression of the site wasn’t great (hidden exchange rates and a deceptive marketing sign up), it seems OK. The currency I looked at was about 1.7% markup (it’s not fee-free, the fee is merely hidden just like with bureau de changes). Transferwise, even with their fee, was still better value though. If it always goes through as a purchase however then it may still be worthwhile… How did you do that? I only get the option to pay by bank transfer. Unreliable public transport? The DLR is the most on-time system in the UK, consistently achieving 98% to 99% on time performance.